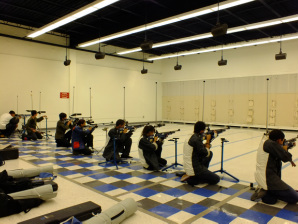 We use air rifles and position skills as well as breathing, stillness, and are five senses and implement them towered taking a shot and trying to obtain the highest score possible, in three positions. Pron, kneeling, and standing. The Shooting Team have about 10 competitions with High Schools from El Paso TX. during the year.